“…and the bloated Rock perched itself on the top of the new mountain, gloating and wallowing in its own self-esteem. The Rock looked down, and saw it was true. Its mountain was feeble, frail. The Rock could hear all the little rocks in the mountain groaning beneath its weight. ‘Maybe my mountain will crumble, but I got to the top, as I set out to do; I fulfilled my dream.’ the Rock righteously said to the Mountain. Suddenly the little mountain the Rock had erected collapsed. The Rock felt itself being dragged down; it toppled down the mountain side and all the little rocks came in its wake. It hit the ground and the little rocks piled in front and back and the sides and on top the Rock. 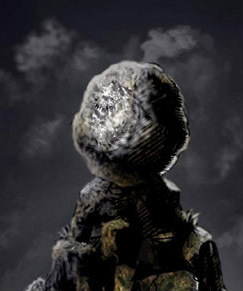 It was trapped beneath all the small rocks that it had gathered for its mountain; they squeezed it tight and the Rock felt like suffocating. Vormar finished the story with a small bow and Karin started breathing again. She didn’t hold her breath through the whole story, that was humanly impossible, but she always held her breath during the last part of the story, when the Rock was smothered under its own mountain. Maybe she did it to empathize with the Rock; as a child Karin always took the side of the Rock in its struggle with the evil Mountain. That was before she understood the metaphorical meaning of the story and realized the folly of the Rock’s actions. But the story had always remained one of her favorites and the chance to hear it now from a master storyteller like Vormar enchanted her even more. The large tents were the only constructions allowed close to the sacred ground. People thronged the large, dimly lit tent. 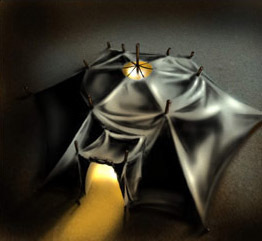 The tent was at the apex of a small camp situated close to the sacred ground. Karin’s eyes were watering because of the smoke in the tent and her buttocks were sore from the uncomfortable cushion she sat on. But the tents were the only dwellings allowed within miles of the sacred ground, a tradition refurbished after the rebellion to give people a better feeling for the ancient rituals and ceremonies performed at the place. One of these ceremonies was to take place that night and Karin was to participate in it. This was the most important ceremony in a Minmatars life, called Voluval or the Test of Destiny. In the Voluval a Minmatar faced his true inner-self and, most importantly, the findings would permanently mark the body for all to see. Karin was to participate that night. Vormar was her essence instructor. His responsibility was to educate those undergoing the test on what it involved and prepare them mentally for it. Karin was thankful to Vormar for telling them the story of the Rock and the Mountain, for it calmed her nerves for the upcoming event. She approached Vormar at the back of the tent where he was putting away his battered copy of Minmatar folk tales; he didn’t actually read from the book, but in his old age he felt comfort in having it at hand in case his memory suddenly failed. “Well, it’s about my tattoos…” Karin began hesitantly. “Don’t worry. You’re of the Minmatar tribe Sebiestor; that’s what is most important.” Vormar said and smiled reassuringly. 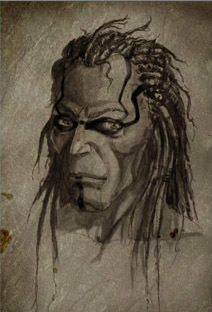 “Not all families have a motif and not all motifs are associated with a specific family.” Vormar said. “Here, let me show you something.” The old sage started rummaging in his trunk. After a while he produced a large leather-bound book. “My father gave me this book when I was your age.” He said. “It illustrates and explains everything you want to know about tattoos. Take a look at it, maybe it will help you decide what motif you want.” Vormar handed Karin the book. She opened it at random. The page showed a picture of a tattooed man, with explanations for each tattoo. Karin flicked through the aged tome, examining the finally drafted images. She already knew the gist of the tattooing tradition; that part of the face was reserved for the clan tattoo and the shoulders for rank tattoos. She also knew that facial war tattoos based on nano technology were very popular among the younger generations. This special type of tattoo could appear and disappear depending on the emotional state of the person. Like all Minmatar children in the Republic, Karin had picked up this basic knowledge of tattoos at an early age. But she was still uncertain about what kind of tattoos to choose and now that the Voluval was fast approaching the time was running out, as she was allowed to get tattoos once the ceremony was over. It wasn’t exactly essential to make the selection now; many only did so after they saw what mark they got. But for Karin the selection meant more than just decorating her body, to her the tattoo motif revealed and reinforced her identity, something she had always struggled with, being a slave-child. War tattoos are not visible while the person remains calm, only the clan tattoos are. The war tattoos only become visible when the person gets angry or upset. Karin sat down in the far corner of the tent to look more closely at the book Vormar had given her. 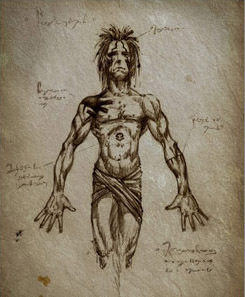 In half an hour Vormar would give the last lesson to her and the other adolescents preparing for the Voluval in his role as their essence instructor and she intended to use these few minutes to study the tattoo book. But when she had just started a commotion in another corner of the tent distracted her. Mattmar Graur and a few of his friends were light-heartedly arguing with some girls. Karin noticed that Mattmar gave her a smile and a wink when he noticed her looking at him and she quickly looked down at the book again. ‘The silly fool’ she thought. She involuntarily ran through the events of last night in her head. Karin was sitting on the flat roof of the tent-house of Graur at the outskirts of the camp. Troinn Graur was the richest merchant in Karin’s hometown of Mithuris, and his son and heir, Mattmar Graur, was sitting beside her. They had been friends since childhood, but since Mattmar hit puberty they’d sort of drifted apart. Mattmar became pompous, vain and superficial, all traits that Karin loathed. But their mutual trepidation for the upcoming test tomorrow night made them seek each other out for support. “What’s on your mind, Karin?” Mattmar asked, watching her stare at the night sky. “You should know.” Karin answered after some pause. “Well, I know what’s on your mind.” she replied, leaning backwards on her hands and staring even more intently at the stars above. “That’s because I always have the same thing on my mind.” Mattmar said with a twinkle in his eye and moved closer to Karin. Karin paid him no attention. “What are you going to do after the ceremony tomorrow?” She asked him. “I dunno, depends on my mark, I suppose.” He answered, obviously not all that comfortable talking about it. Karin looked at him. 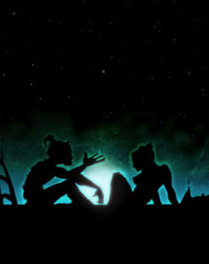 Karin and Mattmar talking under the starlit night sky. Karin saw that he was far from being as confidant about it as he would let her belief, but decided not to press him about it. She was nervous enough about her own mark as it was. She feared she would get one of the degrading marks: the spiraling circle; the scarecrow; the purple cross; or any of the numerous other marks that could forever exile you from Minmatar society. Fortunately this didn’t happen often; Karin had only witnessed it once, when she was six years old. A teenage boy got the worst mark there was: the pale eye. The poor boy had been driven away from the town, not even his family was willing to recognize him, let alone help him. The memory still sent shivers down Karin’s spine and she huddled closer to Mattmar. Of course the boy misinterpreted this for a sign of affection and he tried to put his hand around her shoulders. She shook him off. “What?” Mattmar said in mock surprise. This wasn’t the first time he tried it and failed. Suddenly Karin flared up, all her uncertainties and inner anxiety bursting out. “What!? I tell you what, Mattmar Graur. Tomorrow you’ll be tested, tomorrow you’ll find out what future lies ahead of you, and you shrug it off like it was unimportant. I remember the time when we could talk about the future, our dreams, but now… Now, all you want to do is hang around with the guys and ogle the girls. What happened, man?” Karin shook her dark tresses in disgust. “Well, in that case you should spend more time on your school books than on partying. With your grades you’re lucky if you get to be a waiter in a Vherokior diner.” Karin said teasingly. “Aw, come on. I’ve got brains.” Mattmar replied. “Plus, daddy has some friends in high places; he can get me an internship in the Justice Department. And once I’ve got my foot inside the door…” He thrust his hand upwards. “I’ll shoot straight for the stars.” He finished, laughing. “So, it seems you’ve got it all figured out.” Karin said. “Sure I do. I always have and always will. What about you? I bet you have some fanciful dreams for the future.” Mattmar asked. “Maybe so, but we’re still divided into multiple factions. The Republic is nothing but a loosely united assembly of factions, each seemingly with the only agenda to disrupt and disintegrate the state. We can’t extend our political thought beyond the clan and it’s tearing us apart. The result is that the Minmatars are scattered throughout our world of EVE; billions of them are still enslaved within the Amarr Empire and we don’t have the wits to pull ourselves together to free them.” Karin paused for breath. “I do worry, I’m slave-child, remember. My parents risked their lives getting me smuggled out of Amarr space and they’re still there, slaves to some hideous Amarrian.” Karin almost shouted, her anger and frustration again getting the better of her. “We do fight the Amarrians, we’re doing our best.” Mattmar said soothingly. “Those scums deserve to die, we’ll finish them off and then the Amarrians.” Mattmar responded. “No, that’s what I’m trying to tell you. The Ammatars aren’t our real enemy. The Amarrians just play them off against us, keeping us both occupied. But if we’d unite we could take out the Amarrians for good.” Karin said heatedly. “You know, it’s fanatics like you that give the rest of us a bad image.” Mattmar said, obviously tired of listening to what he considered to be silly ravings. “No!” Karin screamed and jumped to her feet. “It’s people like you that are stifling the Minmatar race. It’s your narrow-mindedness that’s keeping billions of our people enslaved and oppressed this very minute!” Karin was fed up and stormed away, furious. Thinking about all of this now, sitting here in the murky tent with Mattmar and his friends nearby, made Karin regret having said those things to him. Not that she was ashamed of her beliefs, but she shouldn’t have blurted them out like that, Mattmar was just the type to misunderstand the whole thing. She also regretted loosing her temper, it didn’t improve her views in Mattmar’s eyes. Hopefully he would forget the whole thing. 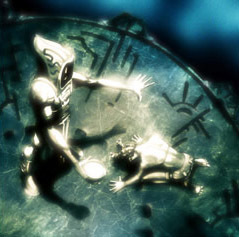 Karin was pulled from her reverie by Vormar’s voice. He was gathering the adolescents around him, in preparation for the guidance he was going to give them in his role as essence instructor. Once they were seated around him, he began. The destiny mark describes that persons's inner-self: What kind of person he or she is deep down. “So, how exactly does the mark appear as it does?” It came as no surprise that Eliza, obviously a keen and bright girl, immediately asked about the most troubling matter on the minds of those undergoing the test. “What kind of injections?” Eliza interrupted. “Well, a large quantity of tyrosine is injected into the heart, which then, through metabolism, is turned into melanin by the body. Frankly, I’m not sure what exactly the mixture injected into the ventral root area consists off; it’s a closely guarded secret of the chemists that prepare it. Only a few of the ingredients are commonly known, among them are acetylcholine, oxytocin, calcitonin, and vasoactive intestinal polypeptide.” The names were clearly just as unfamiliar to Vormar as the rest of them, but at least it was something. “And what does it do?” Eliza probed further. Vormar didn’t seem annoyed by Eliza’s discourteous questions; he was probably used to all kinds of weird or silly or rude questions from those he was preparing for the Voluval. Eliza continued to ask Vormar about the effects and nature of the injection, but Karin ignored them, she’d heard it all before. It was obvious to her that Vormar knew nothing more, or at least was unwilling to reveal it. Like most Minmatar men Vormar was bare from the waist up, only thus could the multiple tattoos be displayed and appreciated properly. 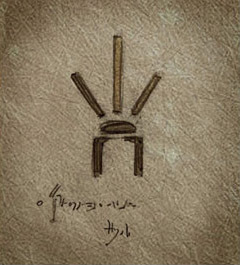 She scrutinized Vormar’s mark: a circled dot just above his navel. Sinuous tattoos coiled around it, but none covered it. It was forbidden to put a tattoo over ones mark. 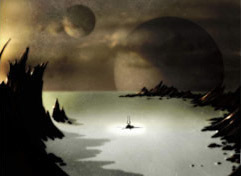 Karin wished her mark would appear on the abdomen like Vormar’s. It was humiliating to get it on the legs or arms or even the back. Karin knew that many dreamed about getting their mark in the face; it was the ultimate honor and brought instant fame to anyone that acquired it. But only one in a million got a facial mark, and the social burden of getting one was something that Karin was certain she could never handle at her age. Once the session was over Karin joined a group of buddies from school. She couldn’t really call any of them a friend; being the only slave-child in the school she was an outsider to most of the others. The group was chatting about idle things, school and the weather; none of them wanted to think too much about the ceremony that was to start in a couple of hours. Not that the ceremony itself was that terrible, but the results of the ceremony could permanently alter the lives of any of them. Suddenly Mattmar barged into the group along with his loud and boisterous friends. “Karin wants to become friends with the Ammatars, she wants to go on a crusade with them.” All the kids laughed and jeered at Karin. The sacred ground was a flat piece of land about quarter of a kilometer on each side. It formed a small stage-like plateau of crystallized rock, formed by the extreme heat caused by the thrusters of a landing space ship. The sacred ground was a flat piece of land about quarter of a kilometer on side. The sacred ground marked the place where one of the huge colonization ships carrying the ancestors of the Minmatars landed thousands of years ago. A circle of fires enclosed the plateau, the flickering lights illuminating the place and blocking out the stars. Spectators numbering a few thousands thronged the area around it, but the plateau itself was empty. In the middle of it, circles and signs had been painted in preparation for the upcoming ritual. The ceremony was about to start. The spirit conductor entered the plateau; his appearance silenced the expectant crowd. Behind the spirit conductor the lesser supervisors filed along, each taking their places on the plateau. Music, rhythmical beatings, sprang forth; the men on the plateau began humming a hymn in time to the music; the Voluval had started. On a stony hillock some two kilometers from the sacred ground a lonesome figure huddled on a rock. Karin watched the ceremony commence, uncertainty written over her face. She wanted to crawl under the rock she sat on, crawl beneath it and disappear forever. But she couldn’t do it, she owed it to the parents she never knew to go back and take the test. She kicked a small pebble at her feet and watched it roll down the hillside, taking dozens of its brethren with it. She made up her mind. If she couldn’t face her fears here, among supposed friends and allies, then when could she? If she wasn’t ready to stand up for her beliefs against her compatriots, then how could she do so when facing Ammatars, or Amarrians? Karin stood up and started running. The spirit conductor sprinkled Mattmar's head with a smelly brew intended to cleanse the spirit. The first few participants were through. All had escaped humiliation and many were proudly brandishing respectable marks. Karin joined the back of the line, ignoring the curious gazes around her. Next up was Mattmar. He strode to the spirit conductor, confidence radiating from him. 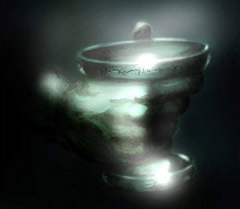 He kneeled before the conductor, who sprinkled Mattmar’s head with a smelly brew intended to cleanse the spirit. Then Mattmar raised his head and one of the assistants handed the conductor a silver syringe. With one swift stroke the conductor plunged the syringe right into Mattmar’s chest, through his breastbone and into his heart. Mattmar’s body tensed, but he didn’t cry out, as so many did. The conductor pulled the syringe out again in another practiced stroke and the assistant pressed a cloth against the small puncture wound on Mattmar’s chest. The conductor continued his ritual mumblings, walking behind Mattmar. Kneeling behind the boy he took another syringe from the hands of an assistant. With his left hand he felt Mattmar’s small back for a second before plunging the syringe into the base of the spine. Again Mattmar tensed, but there was no cry. Mattmar rose to his feet and the conductor placed a black mantle around his head and shoulders, covering him completely. It would be removed once the mark had appeared. Everyone waited in anticipation; the minutes ticked by. Finally the conductor declared that the mark had appeared and removed the mantle. Mattmar looked down, then turned towards the crowd. 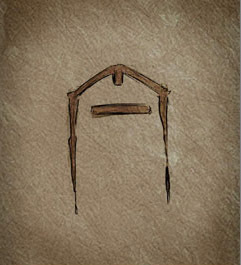 The bull-mark, the horned triangle, was sitting squarely in the middle of his chest. It was the ultimate place for such a mark. Mattmar beamed with pride when the crowd enthusiastically applauded. He took his place on the plateau among those already tested, his haughty manners disgusting Karin. The ceremony continued, one adolescent after another. Karin didn’t pay much attention to the procedure. Between her nervousness and the arrogant glare of Mattmar in her direction her mind didn’t seem to function all too well. At last it was her turn. She walked up to the conductor, trying not to shake visibly. She went through the motions of the ceremony like an automaton, not even noticing whether she cried or not when the steel syringe penetrated her flesh. The conductor’s voice broke through to her; it was time for her saying. She opened her eyes. Over the shoulder of the conductor she saw the toothy grin on Mattmar’s face. Karin opened her mouth and listened to the words spill out: ‘Vain flame burns fast/and its lick is light/Modest flame lasts long/and burns to the bone.’ Karin didn’t realize what she said until it was all out; she was as startled as the others. She saw Mattmar’s smile falter a little. He knew what she meant. Karin went through the motions of the ceremony like an automaton, not even noticing whether she cried or not when the steel syringe penetrated her flesh. Karin felt the tingle, in her spine and under her skin. She wasn’t sure if it felt discomforting or merely unpleasant. The conductor placed the mantle on her shoulders and lifted the hood over her head, shielding her eyes from those around her. Her mind was a blur, but from its depth she heard Vormar’s voice: ‘Keep your mind focused.’ She forced her mind clear, her skin now felt cold and clammy, then suddenly the mantle was pulled off her. She blinked once or twice, accustoming her eyes once more to the bright lights illuminating the small plateau. She looked around her. Every face was staring at her like she had suddenly materialized from thin air. Silence, none spoke, all she heard was her own shallow breathing. The decade old memory of the boy and his pale-eye mark popped into her mind; the reaction then was the same stunned silence. Karin looked down on herself. Nothing, she saw nothing on her torso or abdomen or legs or arms. Then the conductor lifted a mirror and she saw her face. And there, extending down and side-ways from her left eye were several dark lines, ranging from one to three centimeters in length. She caught her breath. It was the Ray of Matar mark, the rarest and most revered of all the marks. In her mind, the stones were beginning to pile up, one by one.